Parkinson’s disease (PD) is a brain disorder that leads to shaking (tremors) and difficulty with walking, movement, and coordination. PD encompasses a variety of syndromes, all of which are progressive and degenerative. Progressive metabolic reduction from within reference range at baseline (Yr 0), through stages of mild cognitive impairment (Yr 2 and Yr 4), and clinical diagnosis of dementia (Yr 5) in PDD converter. 3D-SSP t statistic maps comparing single PDD converter to controls with 18F-FDG PET data normalized to pons. Progressive metabolic reductions in cuneus and precuneus occur before less severe, but more widespread, cortical reductions. Sparing of primary sensorimotor cortical strip is present. LLAT = left lateral; LMED = left medial; RLAT = right lateral; RMED = right medial; Yr = year. In individuals with PD, dopamine- and noradrenaline-producing neurons that normally send signals that coordinate muscle movement are destroyed. As a result, the primary symptoms of the disorder are trembling in hands, arms, legs, jaw, and face; rigidity, or stiffness; slowness of movement; and impaired balance and coordination. The disease most often develops after age 50 and symptoms vary from patient to patient. PD is the most common among a group of movement disorders called Parkinsonian syndromes, all of which have similar symptoms. According to the Parkinson’s Disease Foundation, Parkinsonian syndromes affect approximately 1 million people in the United States and are the second most common neurodegenerative disorder after Alzheimer’s disease. With no known cure for the disease, the goal of treatment through medication is to control symptoms. Patients may be prescribed L-DOPA, a drug that can be converted in the brain to dopamine. In some cases, surgery may be appropriate for patients whose disease does not respond to drugs. A therapy called deep brain stimulation (DBS) has now been approved by the U.S. Food and Drug Administration. In DBS, electrodes are implanted in the brain and connected to a small electrical device. Because multiple neurological disorders mimic Parkinson’s disease and there can be overlaps in multiple conditions, it can be difficult to diagnose. SPECT scanning with the FDA approved radiotracer I-123-ioflupane injection (also called DaTscan) may allow for earlier and more accurate diagnosis of Parkinson’s disease. A scan using DaTscan is able to detect dopamine transporters (DaTs). The distribution of DaTs is abnormal in patients with Parkinsonian syndromes but normal in patients with other conditions, such as essential tremor and Alzheimer’s disease. 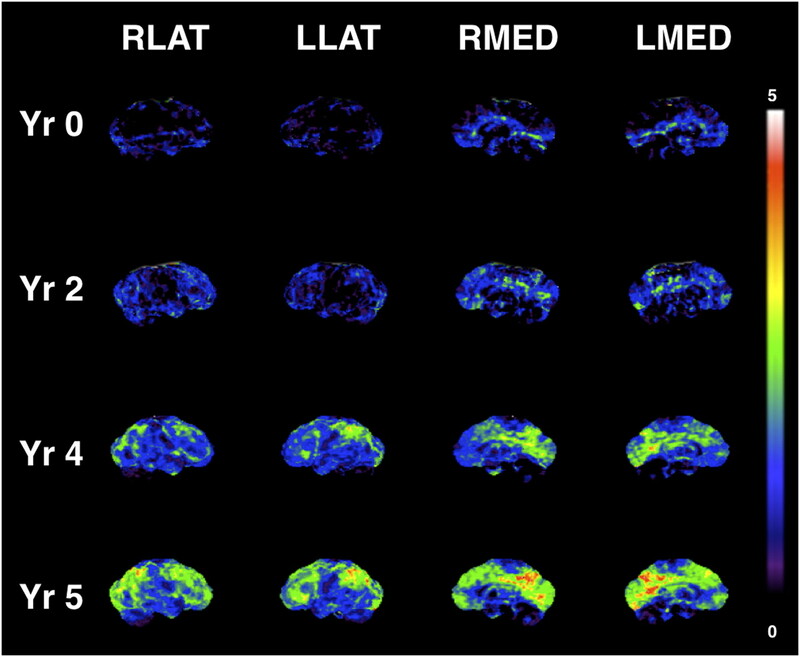 PET scanning with the radiotracer fluorine-18-dihydroxyphenylalanine (F-18-DOPA) is a marker of dopamine activity. By revealing a dopamine deficiency, F-18-DOPA PET scanning is used to help diagnose Parkinson’s disease and distinguish it from other neurological conditions. PET with F-18-DOPA has also been used to measure the effectiveness of dopamine-producing stem cell transplantation. F-18 DOPA is used in clinical trials but is not FDA-approved. Progressive metabolic reduction from within reference range at baseline (Yr 0), through stages of mild cognitive impairment (Yr 2 and Yr 4), and clinical diagnosis of dementia (Yr 5) in PDD converter. 3D-SSP tstatistic maps comparing single PDD converter to controls with18F-FDG PET data normalized to pons. Progressive metabolic reductions in cuneus and precuneus occur before less severe, but more widespread, cortical reductions. Sparing of primary sensorimotor cortical strip is present. LLAT = left lateral; LMED = left medial; RLAT = right lateral; RMED = right medial; Yr = year.